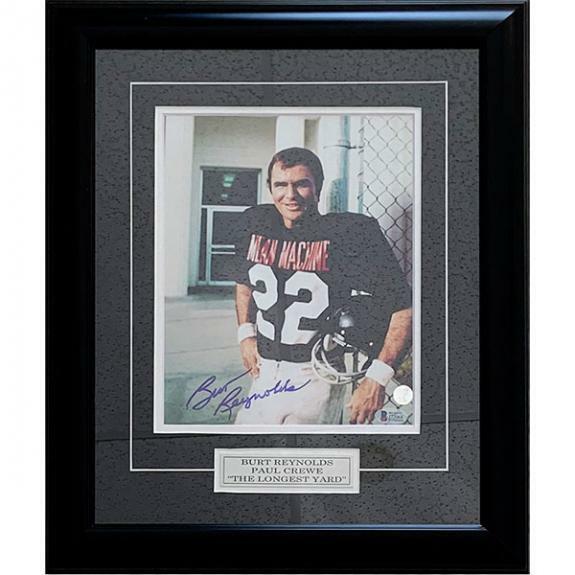 Get your very own framed 8X10 photo that has been autographed by 'The Longest Yard' star - Burt Reynolds. Comes with Certificate of Authenticity and holofoil. Every signed product comes fully certified with a Certificate of Authenticity. Comes fully certified with Certificate of Authenticity and tamper-evident hologram. Also backed by HollywoodMemorabilia.com's Authenticity Guarantee. Usually ships in 5-8 business days. This item ships UPS/FedEx ground only. Please call 800-689-2001 to inquire about expedited shipping.